Nonprofit director Freddy Martinez speaks during an event in Annenberg Hall on Thursday. Martinez discussed strategies for journalists, undocumented people and student activists to protect against data surveillance. A digital rights nonprofit director displayed his three cell phones to demonstrate the precaution he takes to protect his digital security during a talk Thursday. 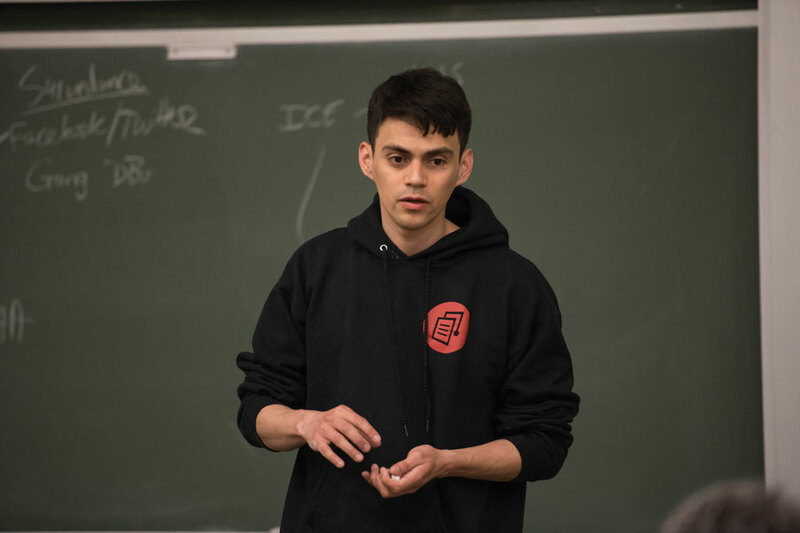 Freddy Martinez — founder of Lucy Parsons Labs, an organization that investigates and advocates for digital security — spoke to an audience of about 15 people in Annenberg Hall to advise them about how to protect their data. Martinez mapped out the threats, risks and strategies of undocumented immigrants, journalists and activists who might be concerned with data security. The event was hosted by the Deportation Research Clinic, the Buffett Institute for Global Studies and various other campus groups and programs. Director of the Deportation Research Clinic and political science Prof. Jacqueline Stevens told The Daily she organized the event after surveillance was brought up at a Wildcat Trump Forum, an event that focused on educating and strategizing in response to President Donald Trump taking office. Stevens told The Daily she thought it would be a good idea to bring in an expert on government surveillance technologies. “We just thought it would be good to alert students and academics and activists as to what they might do to make themselves feel more secure in their communications,” Stevens said. Martinez said the goal of discussions about surveillance is to build a model method for protecting data rather than focus on hypotheticals of what the government can do to access data, he said. “When we talk about things like surveillance, or surveillance self-defense, what we’re actually talking about is a range of risks,” Martinez said. Data security risks include unsecure WiFi networks and file-sharing sites like Google Drive, Martinez said. Users often make risky decisions such as using Google Drive on campus WiFi, allowing hackers to access sensitive information, he said. Targets of surveillance should assess their risks and take steps toward preventing a data breach, he said, particularly activists on college campuses, who he said are threatened by harassment, arrest and even administrative threats. College administrators may not like the positions students advocate, and might seek access to their data, he said. Martinez said student activists should use as many resources available as possible to protect their information. He suggested activists use USB flash drives and Virtual Private Networks, even showing the audience his three cell phones to demonstrate the level of precaution he takes. “Political cover,” or protection by a large community network, could also be used to protect targeted activists with controversial positions, Martinez said. Law enforcement and administrators may be more reluctant to arrest or pursue disciplinary action against students who have a large support network, he said. Martinez said the concerns and risks of undocumented immigrants are the hardest to respond to with self-defense strategies. Their data is especially sensitive, he said, and greater access to that data has made it easier for Immigration and Customs Enforcement to locate undocumented individuals. Weinberg senior Kristen Campbell, who attended the event and is a research assistant at the Deportation Research Clinic, told The Daily that data security is a pertinent issue for the clinic as it works with people who are in contact with ICE. “Whether (people) are undocumented or otherwise, it’s very important for them to protect their data,” Campbell said.